Wed, 24-Apr-2019 - 19:17:25 ---- The fact: 42.844.000 visitors done. Metallisation provides metal spraying and anti-corrosion protection systems around the globe, and boasts a number of successes within the tube and pipe industries. Metallisation equipment and processes are thought particularly effective in re-coating weld areas of pre-coated tubes produced by a tube-forming mill. Tubes can be produced using pre-coated steel strip, which is available with zinc coating (galvanized), aluminium coating (aluminised) or Zn/Al Alloy coating, available under various trade names. The tube is formed by electrical resistance welding (ERW) of the longitudinal seam. During the welding process the heat generated, coupled with the tooling operation to remove the weld fins, destroys the tube coating around the weld area, which, unless re-protected, will corrode. 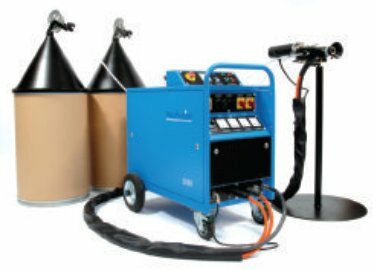 The re-protection of weld damage is achieved by applying a metal sprayed deposit that matches the tube coating. Metallisation can metal spray the weld damaged area with pure zinc, pure aluminium or a zinc/ aluminium alloy. This is believed to be the only method of in-line repair that offers the flexibility of producing tube with zinc, aluminium or Zn/ Al coatings. The Metallisation Arcspray 528E-ICC is a heavy duty high performance pistol, specially designed to work reliably in severe and extended operating conditions. To apply the metal spray to the ERW seam, the Metallisation weld repair system is installed on to the tube mill. The spray pistol must be located as close as possible to the fin removal tool and, ideally, within one metre of the welding coil. When spraying a zinc coating the pistol needs to be around 30mm from the arc point. The spray current, which relates to the spray rate of the pistol, can be varied in accordance with the line speed to ensure an even coating on the seam, even when the line speed changes, eg during ramp-up and ramp-down. Typical line speeds of 60 to 110 metres per minute are normal when arc spraying, but speeds outside of this can be catered for. It should be noted that the coating quality may be affected by the mill line speed and size of the tube, and slight adjustments may be required. The main benefit of the Metallisation Arcspray 528E-ICC system is its reliability in automated applications. In the Arcspray process, the raw material – a pair of metal wires – is melted by an electric arc. The molten material is atomised by a cone of compressed air and propelled onto the ERW seam. This spray solidifies when it hits the surface of the tube to form a dense coating, which re-coats the tube weld area to protect against corrosion. Major advantages of the Arcspray process are that the coatings are available for almost immediate use, with no drying or curing times; there is no risk of damaging/ distorting the component and the use of only compressed air and electricity means more economic coatings.